Photos and images from the 2004 FDL Saint Patrick’s Parade as part of the first ever (rain soaked) Saint Patrick’s Weekend. The parade was title sponsored by Foundation Developments Limited and followed by the Celtic Experience concert sponsored by Nugent Group. 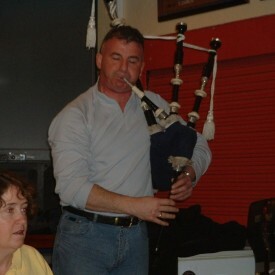 Photos from the 2004 Celtic Weave Concert presented by the New Ross and District Pipe Band – part of the first ever Saint Patrick’s Weekend. 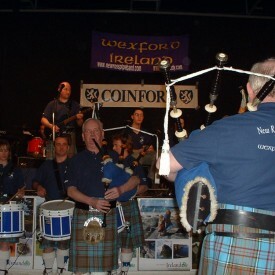 Event sponsored by Coinford Construction and the band by Bank of Ireland. Photos and images from the 2004 Saint Patrick’s Irish Step, organised by the Celtic and Irish Cultural Society as part of the first ever Saint Patrick’s Weekend. Several local dance schools took part in the event. 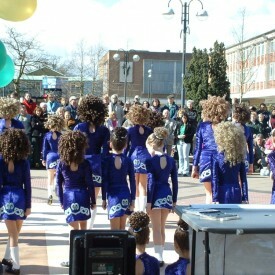 The Irish dance display was sponsored by O’Farrell Building and Construction. The Emerald Club welcomed the New Ross and District Pipe Band to Crawley and hosted a session of pipe, drum and acoustic music. The band was sponsored by the Bank of Ireland during their stay in Crawley. Crawley’s Holiday Inn hosted the ninth annual dinner and dance organised by the Celtic and Irish Cultural Society, on 6 March 2004. 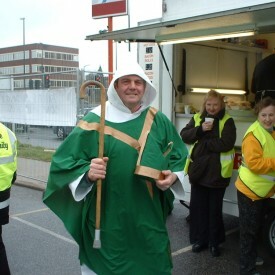 Around two hundred people attended the fundraiser for Saint Patrick’s Weekend. Also in attendance was His Worship, the Mayor of Crawley Brian Quinn. Bank of Ireland confirm support of the Saint Patrick’s Weekend 2004 through sponsorship. O’Farrell Building and Construction confirm support of the Saint Patrick’s Weekend 2004 through sponsorship. Foundation Developments Limited confirm support of the Saint Patrick’s Weekend 2004 through sponsorship. LFN Group confirm support of the Saint Patrick’s Weekend 2004 through sponsorship. LFN have sponsored previous Crawley Irish Festivals and continue to support the local community. The Celtic and Irish Cultural Society was launched on 15 January 2004 to help foster Celtic cultural heritage and arts in the heart of England’s southeast.